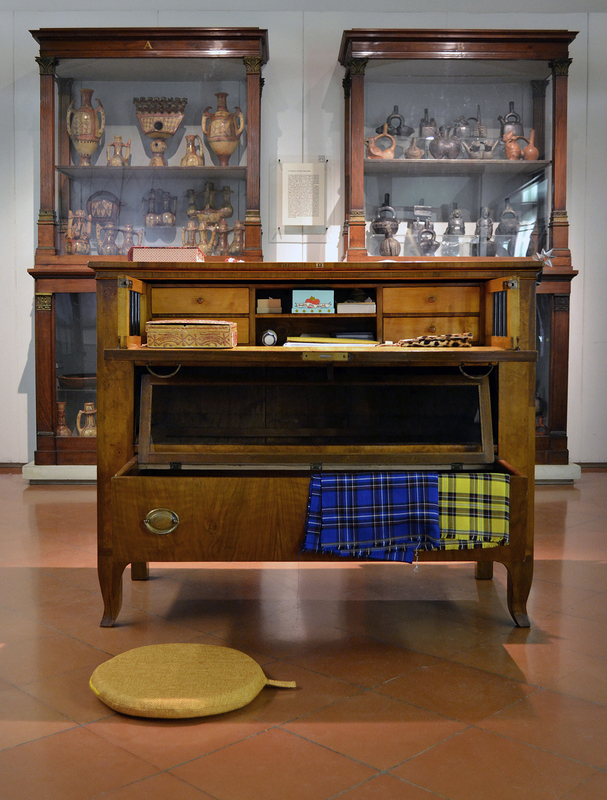 Top drawer: it corresponds to the pergula of the casa-bottega, the top floor where the family used to live, and it is the place in the museum hosting temporary exhibitions. Bottom drawer: it is called secreta and it is the warehouse where the permanent collection is kept together with small personal objects coming from private contributions. It is generally closed but its content becomes visible through a glass window in occurrence of the negotium removal. The collection can be explored by asking the key of this drawer to the reception of the Medieval Museum. The outside surface has been carved during the happening Significato where etching tools where offered to the visitors of the neon>campobase gallery (Bologna 24/09/2009). This performance was conceived as a sort of Christening, but is also referred to Marina Abramovic’s performance Rithm 0 (1974), during which she allowed people to act on her body with different tools of pleasure and torture. Being torture prevaling then and now on human bodies, the founder has tried to “put things back in their place”. The back side is the technical office, with works of various artists conceived in order to increase the user-friendliness of the museum. The hole on the right side (Buco Bello, Cuoghi e Corsello 2012) can be used to post claims to the Direction. I started the OHM project at the neon>campobasegallery on the 24th september 2009; right afterwards I kicked off the activity of the museum at the Medieval Museum of Bologna, with the solo show Mostra Personale; in 2010 I created the Association Musée de l’OHM that has conducted the annual exhibition programme, appointing every year an art director. All the process can be considered an experiment of social sculpture, and has at the same time increased the interest towards OHM as a museum. The direction of OHM was held by the historycian Massimo Marchetti (2010 to 2012), by Marc Giloux (2013) who presented every exhibition with a “critical performace“, and in 2014 by the independent curators Mario Manfredini, Fulvio Chimento, Lelio Aiello, Elisa Del Prete, Katia Baraldi, Carmen Lorenzetti. OHM has held exhibitions of: Alessandra Andrini, Riccardo Beretta, Luca Bertolo, Chiara Camoni, Barbara Cardella, Debora Cavazzoni, Giulia Cilla, Daniela Comani, Cuoghi e Corsello, Caroline Demarchi, Giuseppe De Mattia with Archivio Aperto, Francesco Di Tillo, Dragoni Russo, Alessandro Ferri (DADO), Alessandra Frisan, Francesco Fuzz Brasini, Il Prufesur, Sungho Kosugi, Matej Kren, Jean Louis Lagnel, Marine Leautaud, Jiyoun Lee, Hiroki Makino, Giancarlo Norese, Astridur Josefina Olafsdottir, Giada Patarini, Cesare Pietroiusti, Mili Romano, Martina Scalvini, Orlando Tignatello, Rui Zhang. Together with them have contributed to the collection: Riccardo Camoni, Claudio Cappi, Paola Falasco, Emilio Fantin, Giorgio Forni, Lorenzo Mazzi, Luigi Presicce, Andrea Renzini, Anna Rossi, Valentina Vetturi and other contributions from my private collection. Cultural and educational activities are carried out in partnership with MAMbo – Museo d’Arte Moderna di Bologna. From 2015 OHM is part of the permanent collection of the Istituzione Bologna Musei.